Seasoned product teams, entrepreneurs, and designers have heard it over and over again — you need to validate your ideas. But how? Some aren’t as clear on what it means to validate. It’s one thing to sit down with a few friends in a coffee shop or over Skype to ask them if they think your idea is cool, but it’s a completely different thing to step through a customer discovery process to measure and test assumptions with potential customers and market data. If you’ve spent any time working on a new product, you may want to also remind yourself of why you should do so. It’s critical to understand the “why” behind what you’re trying to build. One of the main reasons to validate is so that you don’t waste time or money building something that has weak demand — in other words, nobody will want it. This is obvious, but it’s important to be clear about because you absolutely need to be focused on high leverage ideas and product features that customers will adopt in volume if you are trying to create sustainable traction. The second reason, which is also very important, is to learn about your market and discover new insights. When you move too quickly into a product idea, you may miss the opportunity to spot an emerging trend or making a profound discovery from an early adopter. This is why it’s important to go through a process fully, with qualitative and quantitative data, from good sources, prior to jumping into any large investments. Most companies that become successful, exist to solve a real problem or strong desire in a defined marketplace. While every startup out there has tons of awesome product ideas, they don’t necessarily understand their customers as well. Most people in tech are excited about leveraging new trends in AI, VR, or some new business model (Airbnb for this.., Uber for that..), yet are unaware of who their audience is. These technologist are focused on their interests. They have cool interests, ideas, and passions, but they must also pay attention to what the market is actually doing to build something sustainable. The number one reason why startups fail is not the idea, it’s the timing to market. Ironically, if they are too focused on the technology itself, instead of building for customers, they might miss the important nuances in the problem space which allows them to leverage emerging technology. At best, they will be guessing about what people will truly need in the future. Put down the VR helmet, and talk to a human. Here’s the truth: Without key insights, you’re making assumptions. But that’s what technology is about, right? Well, it’s also about being insanely focused on a problem that you understand it better than anyone on the planet. Where does a key insight come from? By understanding a problem well, through qualitative and quantitative data, you’ll have a better chance of closing the gap between vision and reality — puzzle pieces to iterate with. Imagine if you were driving for the first time in a busy foreign city with no directions, no GPS, no street signs, and you needed to get to a destination fast. This would be much more difficult than if you knew which turns to take and the name of the streets. If you added in a GPS that pinpointed the exact turn-by-turn directions, and provided you that information, you would be there in no time. This destination is your product and the turn-by-turn navigation is your data. When researching a market, you can easily spend hours, months, or even years absorbed in whitepapers and reports, but most likely you will want to move faster. To move fast, you need to focus on the top 20% of validation methods which will give you 80% of the results, shedding light on whether your idea is worth pursuing. What are the problems, needs, and desires in this market? Who are the competitors in the space? Who is the biggest competitor missing? What’s the demand for a solution to this problem? To gain insight into this data, you can use online and offline techniques. One highly effective strategy is to conduct a SWOT analysis of the internal and external origins involving the venture. The second, more human way, to understand the problem space is to “get out of the building” as Steve Blank would say. Talk with your target market in person. You could do this virtually over Skype, but I would recommend meeting with real people if you can. Try to go to their environment, and gain an understanding of the context which the problem lives in. Remember that you’re talking with them because you most likely have unproven assumptions about a problem, desire, or need. Talking with people is the best way to test your assumptions with the market and get honest feedback. It’s critical that you bring focused questions to these sessions. Here are some of the best questions to ask during customer discovery. When researching a market and talking with customers, you need to remember that these are real people. They are not functions that you can write a test suite for. They have emotions. They have psychological biases. Things are not purely mathematical. 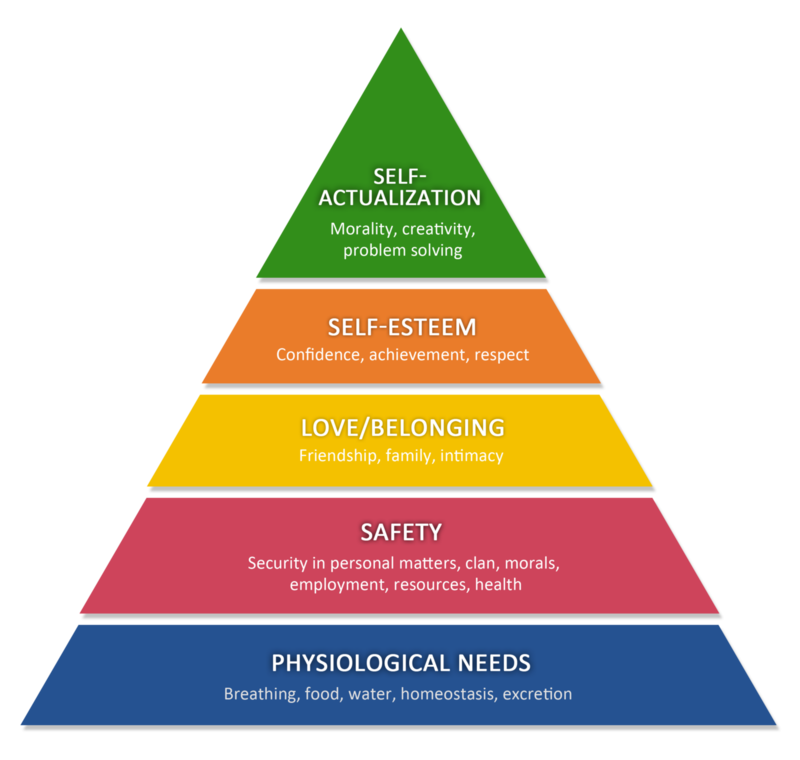 You need to understand “What is driving their decisions?” As humans, we have a hierarchy of needs. (Maslow’s Hierarchy) Our purchase behavior is often triggered by one or multiple segments of this pyramid. It’s important to understand what is motivating buyers to engage as it will help tailor your marketing material and messaging further helping to validate if you can create demand within an emotional context. Consider the top 3 motivators that will drive customers to engage with your solution? Demographics — where are they located? what is their age, gender, nationality, religion? Behavior — how do they behave in different environments? with different resources or circumstances? Professional Jobs — what are the jobs they need to get done? Problems — what is their #1 challenge in the problem space? Social Engagement — what do they engage with on social platforms? When you have a deep understanding of who your customer is, you will find that they approach their lives in sequences or journeys. Most people already have products that support their lifestyle, and those products are used at particular touchpoints in their journey to accomplishing their unmet problems, needs, or desires. When you’re validating a new product, it’s important to map your customers’ journeys closely to identify gaps or areas where your product would fulfill one of their unmet concerns. Typically the goal with a product is to improve the lives of the people using it. You most likely won’t be creating a product that aggregates or frustrates your users. By looking closely at where your product will be used in a customer journey map, how it will fit into the lives of your users, you can better position ways to validate, and create a strong proposition. To map a customer journey, you can start by compiling a series of user goals and actions into a timeline that will also highlight the thoughts and emotions of your user’s narrative. You’ll want to identify three main categories in your journey map. The Lens — Who is this person? What’s their customer persona? The Experience — What are the goals, actions, thoughts, and emotions taking place? The Insights — What are the key findings, pain points, and opportunities a new product can address? Also, remember that this journey may happen across multiple channels. Think of it as a diagnoses of issues online and offline, with any number of different contexts. You should have a clear goal in mind before detailing the experience, such as learning how the user behaves in a certain situation. Considering there may be many components to highlight throughout the journey, you will want to position the map to help you reach your goals. Journey maps should always be created to support a known business goal. Maps that do not align to a business goal will not result in applicable insight. You may be wondering, how can I better understand the emotions and thoughts taking place during the experience? This goes back to understanding the customer persona. You can further investigate qualitative data about a user’s experience through field studies, contextual inquiry, and diary studies. Tim Brown from IDEO coined a term, Design Thinking, which has been used to approaching innovative product design since the 90’s. By gaining a deep understanding of your target market, customer personas, and customer journeys, you’ve successfully started the first phase of the Design Thinking process — to understand. With this foundational empathy, you can then begin to define the opportunities for improvement. Where do the problems exist? Where is the attention going? As you begin to identify the opportunities within the journey, you can also continue to ideate. Assess your current idea. With a better understanding of your the market and your customer persona, what are creative ways you should rethink the solution? Does your existing idea need to be refined? What are different ways to approach the problem? What have competitors missed in addressing this area? An important piece to remember in this ideation is how your ideas fit into the wider business model. I highly recommend leveraging Alex Osterwalder’s Business Model Canvas to accompany ideation of product solutions. You should collaborate closely with your team to understand the ways your product will function within the aspects of your business model. When examining the business model, you can ask key questions to evaluate the value and efficiency of the product idea on a scale of 1–5. Will this take advantage of the opportunities identified? Will there be demand for this? Will customers pay for it? Are the features desirable to customers? How easy is it to sell? How often can it be used? What would stop a customer from using it? A common technique is to use sticky notes during this process to map out all the ideas related to the comprehension of the experience. Remember that you should only judge these ideas after you have taking the time to brainstorm as many as you can. At this point, you should have a robust understanding of your ideal customer and how your product will solve their unmet needs. This is the entire point of validation. You are trying to close the gap between a vision and reality. When you gain enough confidence that you have something worth pursuing, then and only then should you go about creating a lean experiment. At this point, it should merely be a value experiment to test if people will actually want to the value your product provides. When you think about it, a product is nothing more than a digital or tangible experience where value is translated to a user through a user interface or functionality of some kind. It could be a web or mobile app, a device, or a designed product that works in some specific way. The goal here is to communicate this value to a user, as lean as possible. An important point to make here is that you don’t need to create the product. You merely need to translate the value through a marketing channel with marketing material or a prototype. You can use any number of tools to wireframe or mockup the solution. Here are a few common tools. There are countless ways to promote and market your lean value experiment. These examples are just scratching the surface. A key idea to remember here is that you will most likely need to iterate on your idea. Choose one or two channels where your target market will be most engaged, prepare templates for these channels, and iterate on the promotions. The last piece to validation, and one that will actually reveal the viability of your product idea, is to measure the results. You must track how your lean experiment performs with your target market. This last step will create closure to the Design Thinking cycle and validate if the idea is worth pursuing further. You will want to measure the response to your lean value experiment through the marketing channels and distribution method you leverage. If for example you are running a PPC Ad, you will want to track engagement and conversion metrics. How many clicks, shares, website conversions did your Ad get? If you’re sending an email, how many people opened and clicked through? At the end of the day, validation can literally be as simple as sending an email. What’s more important is the upfront research involved with identifying these opportunties. Typically, the main conversion metric that is trying to be revealed with a product is, will someone actually pay for this? Collecting pre-sales on a landing page, pre-order form, or within a marketplace can help you identify this. If you can answer that question with a yes, you indeed have a product idea worth pursuing and taking to the next phase. So, what happens if the nothing really happens? What happens if people don’t care? What if they don’t buy? First off, make sure you set a clearly defined deadline for when you will stop the promotion. You do not want to endlessly keep running the same campaign expecting different results — that is no better than investing in your full product development. The best way to move forward is to log what you discovered, stay accountable, iterate, and don’t make the same assumptions moving forward. You will need to pivot into something new, fully knowing that your assumptions were wrong and you need to set new ones. As you continue to do this, you can move closer to a validated idea. In conclusion, creating a new product is awesome — but stay lean and validate the idea first. Start by understanding the market you’re entering, talk with real users, look at trends, research market data, and map out the customer journey to reveal potential opportunities for new products to exist. Take the time to understand the psychographics and persona of your potential users, and build a human relationship. These people should be willing to give feedback, and you will want to thank them for being early adopters of something new and innovative. Treat your customers right! Lastly, measure and iterate. A product never survives it’s first contact with the customer. Learn from your mistakes, don’t continue to make the same assumptions, and move forward with persistence, creativity, and accountability to create a product that makes better lives for your users.